Medical Heed is clean & beautiful free multipurpose medical WordPress theme, This theme well suited for a hospital, general clinics, nursing home, dental, gynecology, veterinary clinics, pediatric and overall medial websites as well as personal portfolio sites for doctors, surgeons, gynecologist, general therapist, and all medical sector people. Medical Heed is one of the most accessible themes which can easily accommodate all type of users with no coding skills to advanced developers. Medical Heed includes excellent features for medical professionals and practices of all kinds, with one click demo data import, customizer based theme options, page builder-friendly design, page & post layout options. 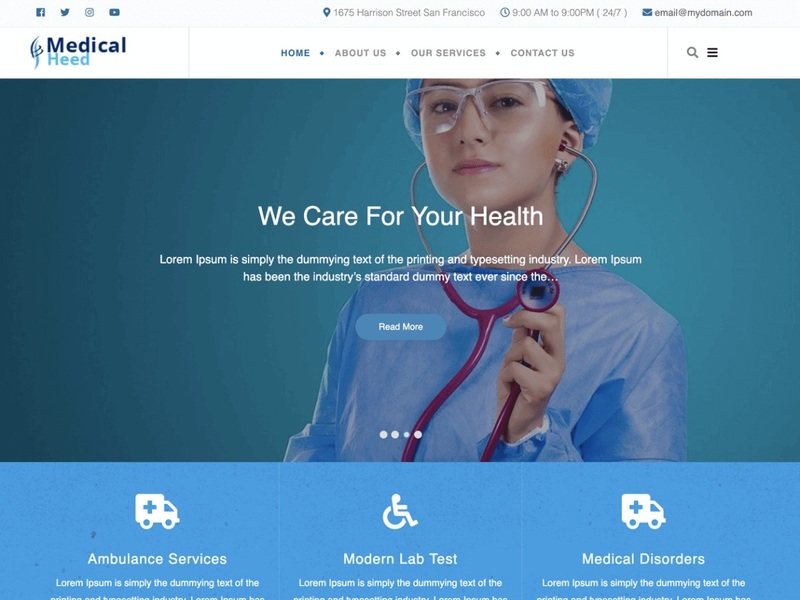 This Free Medical WordPress theme is fully responsive, cross-browser compatible, translation ready, SEO friendly and social media integration. if you run into any problem while using our theme, you can refer to extensive documentation or contact our friendly support team.